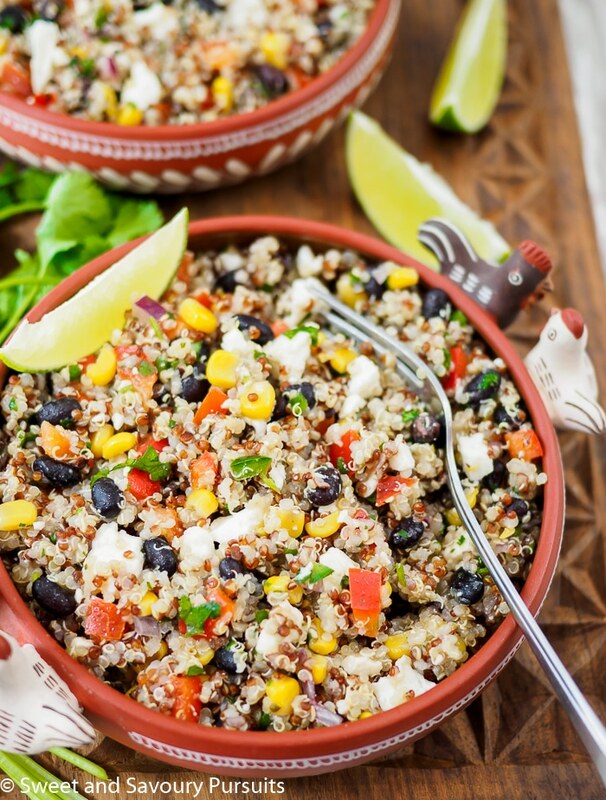 This flavour packed vegetarian Southwestern Quinoa Salad is loaded with protein, fibre and is gluten-free. Perfect as a side for dinner or main for lunch! I don’t know about you but I’m craving some serious sunshine. I find that by this time of the year I’ve often had enough of winter, unfortunately we are nowhere near the end. So to get my little bit of sunshine today, I decided to make this fabulous Southwestern Quinoa Salad. It’s filled with colourful veggies and the citrus dressing brightens up the salad and makes me feel like I’m absorbing some much needed sunshine! 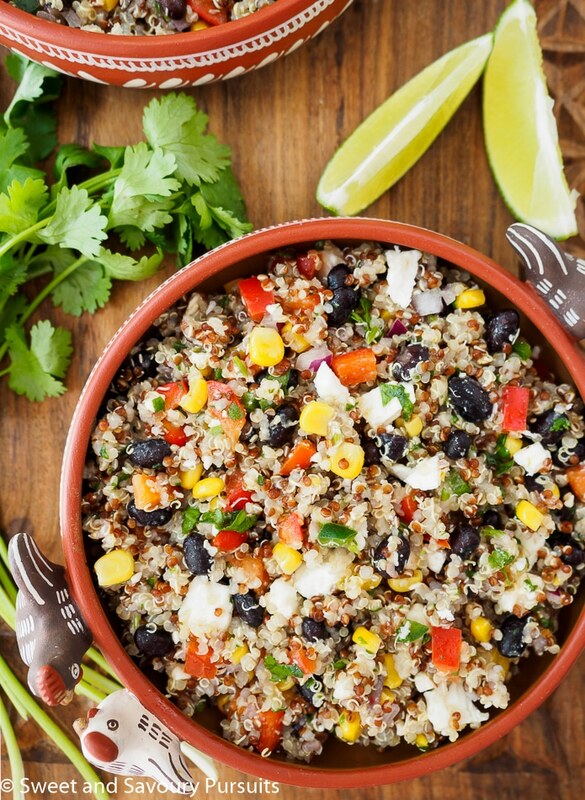 This Southwestern quinoa salad has a great combination of textures, as well as sweet and salty flavours. It can be enjoyed as an accompaniment to another dish or as a main. It lasts several days in the refrigerator so you can easily make it on the weekend and keep some for your lunches. It’s also a great vegetarian meal as quinoa is an excellent source of protein. This salad also provides you with a good amount of fibre and is gluten-free. I wrote this recipe the way I like to eat this salad, the ratio of quinoa to beans, vegetables and the feta cheese is the way I enjoy it. You may prefer less beans and more feta cheese or no cheese at all, it’s really up to you and depends on what you like. That’s what I find great about salad recipes, you can easily adapt them to suit your preferences. If you love quinoa and are looking for something sweet to incorporate it in, take a look at these recipes: Cocoa Quinoa Puffs and Peanut Butter Squares, Quinoa Chocolate Chip Cookies, and these delicious Banana Chocolate Chip Muffins. Rinse the quinoa thoroughly to get rid of its bitter coating. In a large saucepan, bring three cups of salted water to a boil. When the water boils add the quinoa, cover the saucepan and reduce the heat to medium. Cook for about 15 minutes or until all water has been absorbed and then let sit covered for 10 minutes. Remove cover, fluff quinoa with a fork and let cool completely. Meanwhile prepare all of the other ingredients. Combine the juice of 1 lime, 1/2 a lemon, the olive oil, cumin, salt and pepper, set aside. Once the quinoa has cooled, combine it with the black beans, corn kernels, diced red pepper, jalapeno, red onion, feta cheese and cilantro. Pour the lemon-lime dressing over the salad and toss to combine. Cover and refrigerate the salad for at least 1 hour to allow the flavours to meld. Yes, I agree it is really a refreshing salad and really healthy, I think it’s time I make it again. Sounds like a perfect dinner! Thanks. It really is a great dinner, or lunch. I’ve even had it for breakfast, it’s that good! What an absolutely beautiful creation! Thank you…. Looking forward to more! This one I will definitely try since I love all the ingredients in the list :especially the feta. I have a quinoa question however : is it ok to cook the quinoa the day before you make the salad? I always run into this issue because it’s always at least 4:00 by the time I’m making dinner and there’s no time to let the quinoa cool. Yes, absolutely you can. In fact, it’s a great way to speed up the preparation. Let me know how you like it.